I want to thank all of our friends from across the country for praying for us as we have been hammering out the master plan for the buildings on the Lakeshore Baptist Church property. As you probably know, when Hurricane Katrina leveled our old church buildings we did not immediately begin rebuilding our permanent facilities. Instead, we quickly erected temporary structures as we moved forward. We had a few reasons for taking this strategy. The one that has received the most publicity has been our strong desire to minister to the needs of our community before focusing on our own needs. At the same time we realized that God’s church buildings deserved more thought, vision casting, and planning than we were capable of while undertaking a massive disaster relief and recovery effort. Any church facility consultant will tell you that a church needs a clear vision of its future ministry before moving forward with brick and mortar plans. That kind of clarity proved impossible in the immediate aftermath of the storm while we literally dug out from under the rubble and stood in need of temporary shelter. Everything in our community had changed. For weeks and weeks we did not even know whether most of our families, friends, and church members were alive or dead. In the past five and a half years of intense recovery God has begun giving us a long term vision for the ministry of Lakeshore Baptist Church. A couple of years ago, we sketched out the building needs that will serve the ministry for years to come. The master plan of the Lakeshore Baptist Church property rebuild includes 6 buildings: the church office, a bunk house, the mercy house, a storage building, a fellowship hall and the main sanctuary. The first two buildings, the office and the Bunk House are complete. The third and fourth buildings near completion. The fifth and and sixth buildings, the fellowship hall and sanctuary are on the drawing board. Site plans for the entire church property have already been approved by the Hancock County Planning and Zoning Commission. 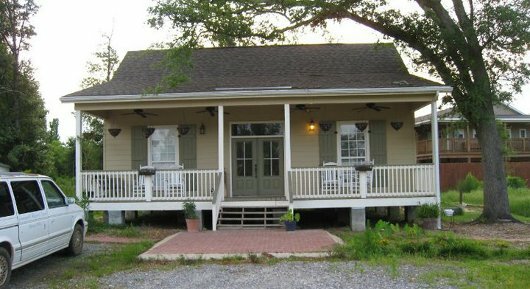 The current church office, already completed, houses two main offices (one for the pastor and one for his administrative assistant), a multi-purpose conference room, a closet, a wide hallway, a bathroom, a spacious front porch, and a screened in back porch. 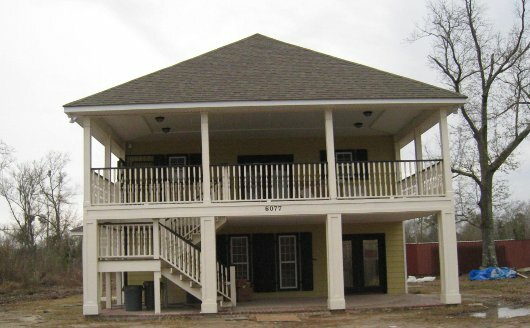 The cozy 670 sq’ building serves as a hub for all the church ministries. A 1,500 square foot bunk house sleeps up to 38 people in two large bunk rooms. The two accompanying bathrooms have three sinks, commodes, and showers each. 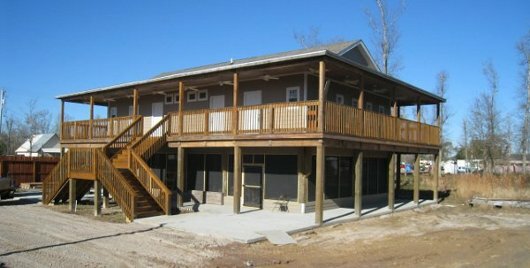 A large wrap-around porch surrounds the building that sits 11′ above grade. This structure will allow us to expand our housing capacity as we continue hosting volunteers in our mercy ministry. Long term, the facility will open the door to numerous ministry possibilities, such as camps, retreats, seminars, conferences, and of course visiting friends we have made in the last four years from across the country. Lakeshore Baptist Church has a strong desire to continue and expand our mercy ministry of providing food, clothing, and household items to those in need. The 2000 square foot building sits about 11′ off grade. We have enclosed the bottom half of the building, in compliance with the county’s flood mitigation policy, and use this area to store the items distributed through our mercy ministry. The upper level will house a bathroom and one large multi-purpose room for various types of community outreach and educational activities. As of February 2011, the building stands very close to completion. 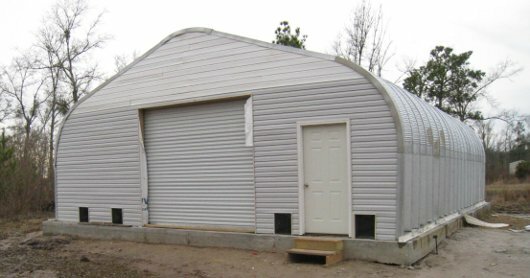 Last month we moved all our distribution center inventory to the new location and dismantled the two quonset huts and removed nine sheds we have been using for that ministry. When the walls and ceilings receive their texture and final coat of paint, we hang some cabinets and lights, and hook up the plumbing fixtures, the building will be ready for final inspection. I look forward to a grand opening to celebrate this milestone in our progress. While not as glamorous as the other five buildings, we see the need for a good sized storage facility to serve the ongoing needs of the ministry. This bare-bones 1200 square foot building will sit behind the mercy house. We have erected the structure and just need to build some back steps to complete the project. After completion of four out of the six proposed buildings, we look forward to breaking ground on the main church complex, which comprise the next two buildings. Construction will proceed in a two phase process. First the Fellowship Hall building, followed by the main Sanctuary. The fellowship hall building will house a great room, kitchen, restroom facilities, and classrooms. This structure will connect to the proposed sanctuary on the upper level via a wide hallway. This configuration will allow the two buildings to share an elevator and restroom facilities. The basic footprint will span approximately 100′ X 70′ with a jut out the back of one side for the kitchen area and the hallway connecting to the sanctuary to the north. For those familiar with our church property, the fellowship hall will sit adjacent to the metal building and in front of the former location of the two quonset huts used as our old distribution center. Last month we began site prep as enthusiasm grows for this project. The church recently voted and approved the proposed floorplan. We currently are drawing up the final construction documents and hope to apply for a building permit very soon. After we complete the fellowship hall, construction on the new sanctuary can begin. This building will sit in place of the existing camp kitchen, along Second Street. We envision a place to accommodate growth and special events as we continue to reach Hancock County for Christ. The inviting entryway will open into a spacious lobby with a welcome center. A wide hallway to the right will give easy access to the restrooms and the fellowship hall. The public worship space will replace the metal building currently being used for this purpose. Ongoing discussions, planning, and prayer on the exact design of this building continues as work on the other buildings progress. We will need help to complete all these construction projects, so feel free to contact us to schedule your next mission trip or to contribute to our building fund. We believe God has great plans to continue working through Lakeshore Baptist Church to the praise of his glory and grace. Please continue to remember us in prayer as we seek to follow the Lord’s leadership for the spread of his fame in Hancock County and around the world.